In the new edition of this successful and authoritative book, the thalassaemias are reviewed in detail with respect to their clinical features, cellular pathology, molecular genetics, prevention and treatment. It is aimed at specialists in haematology in the laboratory or clinical setting, particularly in areas where thalassaemia is common either in the native population or in immigrant communities. The fourth edition has been both updated and re-organized. Three new chapters have been added on the link between alpha-thalassaemia and mental retardation, on avoidance and population control and on global epidemiology. Considerable emphasis is placed on molecular pathology reflecting the huge burst of information to have come out of this field in the last few years. Sir David John Weatherall, GBE, FRS is a British physician and researcher in molecular genetics, haematology, pathology and clinical medicine. J. 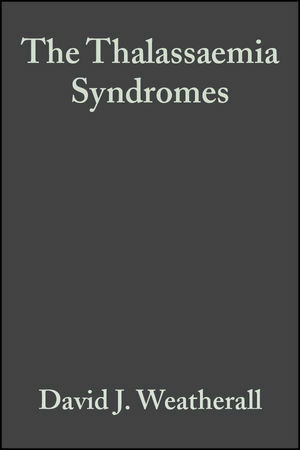 B. Clegg is the author of The Thalassaemia Syndromes, 4th Edition, published by Wiley. 1. Historical Perspectives: The Many and Diverse Routes to our Current Understanding of the Thalassaemia Syndromes. Part 2 The Biology of The Thalassaemias. 3. Thalassaemia: Classification and Relationship to Other Inherited Diseases of Haemoglobin. 4. The Molecular Pathology of the Thalassaemias. 5. Pathophysiology of the Thalassaemias. 6. The World Distribution and Population Genetics of Thalassaemia. Part 3 Clinical Features of the Thalassaemias . 8. The delta beta and Related Thalassaemias. 9. The beta and delta beta Thalassaemia in Association with Structural Haemoglobin Variants. 10. Hereditary Persistence of Fetal Haemoglobin. 11. The alpha Thalassaemias and Their Interactions with Structural Haemoglobin Variants. 12. Thalassaemia withmental retardation or Myelodysplasia. Part 4 Diagnosis and management of thalassaemia. .
14. Avoidance and Population Control. 16. Laboratory Diagnosis of the Thalassaemias. "The book should be part of the library of every haematologist..."
"No library of any consequence should be without this up-to-date reference volume." "...the only standard, comprehensive text...a must...They have done a grand job."